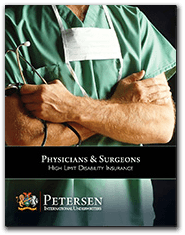 Physicians & Surgeons Disability Insurance Plan was designed to provide men and women working in the medical field with proper levels of income protection. This plan allows medical professionals to maintain their standards of living in the event that an injury or illness leaves them unable to work. With issue limits as high as $150,000 per month (or more) and participation limits up to 75% for personal income protection and as much as 100% coverage for business uses, our Physician and Surgeons Disability Insurance Plan will provide adequate levels of disability benefits to keep your clients properly covered. Dr. D, a 43 year old Radiologist, had an income of $350,000. Traditional carriers maxed out at $10,000 per month. This only covered 34% of his income. Petersen International Underwriters provided an additional $9,000 per month bringing his level of coverage to 65% replacement. This is an example of daily business out there. Income earners of $150,000 or more are excellent candidates. Start with your own client base and see if they are properly insured to replace at least 65% of their income. If not, give us a call. Working in a specialty occupation sometimes necessitates a High Limit Disability Insurance Plan. Unfortunately, Physicians and Surgeons can find it difficult to obtain sufficient amounts of disability insurance from traditional carriers. Disability insurance is the cornerstone of a secure financial plan. A disability resulting in your client’s inability to return to work would be financially ruinous if sufficient insurance coverage is not in place. If your clients who work in the medical field are dissatisfied with their current amount of disability insurance, PIU’s Physicians and Surgeons Disability Plan is available to them. We will help you expertly explain disability plan options to allow you to prescribe adequate levels of income replacement. Click the image for real life claim stories.